We come across some of our Dutchbone products on our travels abroad. After buying them we add them to our collection straight away, just as they are. Other items are far more time-consuming, especially if we design them ourselves. Our new Flair is a good example of an armchair that was born on the drawing board. The whole process took well over a year to complete, but now we can present her to you at last! So with no further ado and lots of Dutchbone applause we hereby present you with The story of Flair! The actual inspiration for Flair came about thanks to the Japanese organizing consultant Marie Kondo. After reading her book, one of us decided to clean out the attic and came across the most wonderful items. Apart from old record players and an inherited dinner service, she discovered an old armchair that had belonged to her granny. This red armchair with cute little skirt stood in our lab for weeks. All that time we looked at it, thinking ‘this chair has a future’, but how were we going to bring it into the 21st century? In its present state, ‘Granny’ was way too low, her upholstery too hard, her colour too faded and that skirt was all very well but desperately in need of an update. However, the seating concept behind it was bang on trend: an elegant lounge armchair with a classy look. It fits perfectly in our Sophisticated Chic trend. We eventually set out the demands that this new Dutchbone chair would have to live up to. It would have to be elegant and classy, not too high and not too wide, super comfy with lovely soft fabric and have a decorative, fashionable skirt around it. It should also give off a hotel lobby feel; a chair you sink into and don’t want to get out of, one in which you catch up with a friend or drift off to dreamland in with your cocktail. You probably get the picture. The idea was born. 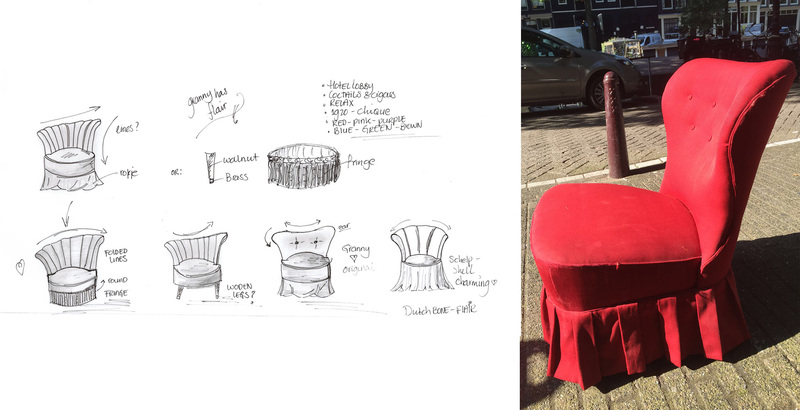 The next step was a sketchbook filled with drawings, doodles, words, themes, synonyms and names for this little chair. It was from this book bursting with creativity that the definitive design for Flair eventually emerged. During the sketching phase we had changed more or less the entire model. As we made choices regarding design, comfort, material and colour, the chair went through an extensive metamorphosis. Granny was updated and became Granny 2.0. 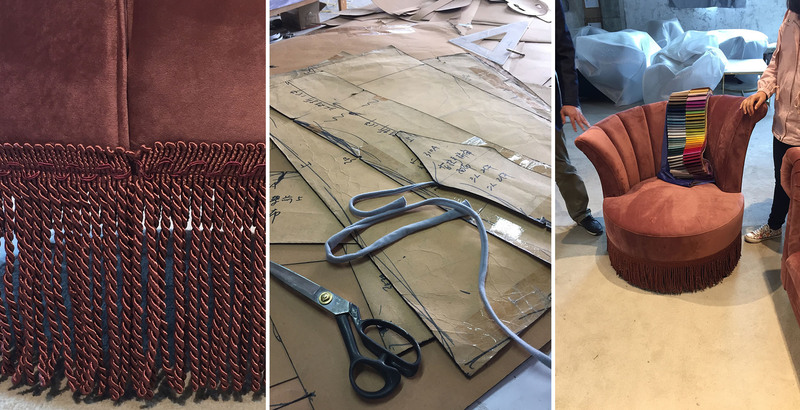 The next step was to have prototypes made by our amazing furniture maker in China. A few weeks later we went to meet Granny 2.0 for the first time. After working on the chair for so long, the Dutchbone design team was really excited to see how it had turned out. It was still dark when we got off the plane early that morning. Shanghai was rainy as we grabbed a taxi, our bags filled with the sketchbooks, papers and samples for the chair that we’d wanted in our collection for so long. When we got to the furniture maker, Flair – as Granny had been named along the way – was standing there waiting for us and we all agreed she had turned out lovely. As you may have read in our previous blog, the ingredients of the trend we call Sophisticated Chic are dark colours, nut-wood and gold. That’s why we use old pink, brown, dark green and gold for our Flair chair. And the skirt? Well, we changed it to a decorative wavy fringe.. Our attempts to keep granny’s fabric skirt failed, because we felt the fabric hung too stiffly. A frivolous fringe was the perfect solution for Flair. It adds the finishing touch and really gives you the sense of sinking into an uber-chic lounge chair. We add some matching Dutchbone items to complete the look. We decide to include an extra edition of Chester upholstered in the same gorgeous Flair fabric, while table Boss and carpet Arizona turn out to be the perfect companions.